Help needed – is John MUIR one of the unknown people in the photo used in the banner of this blog? I was surprised to see this Memorial Inscription as my deceased father had left a note saying that John had ‘gone to Kenya’. I had been able to locate the dates of John’s birth and marriage, and some census records, but then had lost him, I presumed to ‘Kenya’. Clearly John had not died in Kenya. What was the story here? John was born at 6:30 AM, on 30 April 1872 in Beoch, Maybole, Ayrshire, Scotland. His father, James MUIR, was a farm overseer at the time of John’s birth. John was the 4th child and 3rd son of James and his wife Helen MCNAB. Eight year old John was with his family at Slaphouse Farm, Ayr in the 1881 census. He attended a local school, likely Alloway, with the rest of his siblings. His father James occupied the position of ‘bower’ (probably a farmer who tended cattle) at Slaphouse Farm. (photo below). By the time of the 1891 census John lived with his family at Mainholme Farm, just outside Ayr. James, John’s father was the tenant Farmer of Mainholme. Unmarried, John was 18 years old, had completed school and worked as a ‘farmer’s son’ full time at Mainholme. Ten years later, in the 1901 census John, 28 years old, still lived with his family at Mainholme Farm and worked full time on the farm. By this time several of his nine siblings had left home, married and started their own families. The 1901 census also lists Agnes Wilson RUSSELL, whom John married on 12 December 1902. The marriage took place at the Athole Arms [Hotel] in Ayr. John was 30 yrs old and Agnes 27. It is possible that John and Agnes appear in the family photograph used in the banner of this blog, which was taken about 1900 outside Mainholme Farm where John’s parents still lived. No photograph of John or Agnes has yet been found or identified for comparison. Agnes, was born 8 November 1875 at New Barns, St. Quivox, Ayrshire to James RUSSELL, labourer, and Isabella WILSON. In the 1901 census Agnes is living with her 65 year old father James (woodman (estate)), mother, brother David RUSSELL, 27, woodman (estate), and 25 year old sister Anna Bella RUSSELL. Place of residence is New Barns, St. Quivox where they had lived at least since the time of the 1881 census. For 20 years after the marriage of John and Agnes, they disappear from normal documentary evidence. They do not appear in the 1911 census in Scotland – at least I haven’t found them yet. The next thing known for certain about John is that he died at Dean Cottage in Ayr on 9 December 1921. He was only 49 years old. Cause of death was ‘tuberculosis of bladder and prostate’ which had been diagnosed for at least 12 months. His occupation was listed as ‘farmer’. 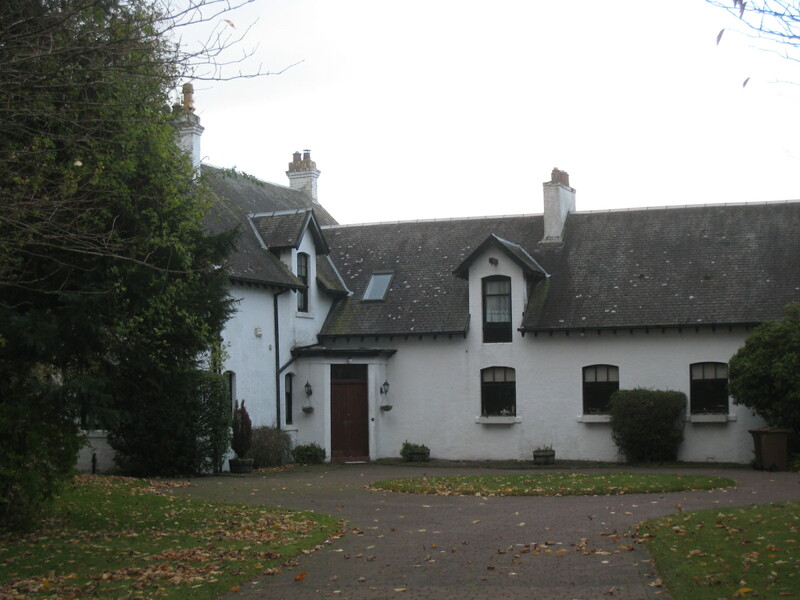 Dean Cottage, where John died, was the home of his parents, James and Helen (MCNAB) MUIR, retired famers, both of whom were still living. John’s wife Agnes was the informant of his death so we know that she was also in Ayr at that time. Agnes, who lived for another 24 years, died on 30 December 1945 at 82 Brownside Drive, Glasgow. Her usual residence was 45 Loudon Road, Newmilns. Did John and Agnes go to Kenya? John had worked all his life on farms; did he use this experience to branch out in a new country? This is possible as others from Ayr, including possibly at least one of John’s brothers, had gone to ‘Africa’ to work as farm managers or labourers. With John’s agricultural experience was he a farm manager on one of the big Kenyan estates? Did John and Agnes go to Kenya shortly after their marriage and come back to Scotland when they learned that John was seriously ill? If so, is that why John died at the home of his parents? This might be the case if they returned to Scotland without the resources, or time, to acquire their own living arrangements before John’s death. A thread of a clue about John and Agnes’ location between their marriage in 1902 and John’s death in 1921 is offered in Agnes’ 1945 death registration and ship passenger records. At time of Agnes’ death she was identified as the widow of John MUIR, Farm Manager. A search to date of passenger records both leaving and returning between the UK and ‘Africa’ in the 1902-1921 period has produced only one clue, but it may be significant: On 1 March 1913 the ship ‘Goorkha’, arrived in London, England from Mombasa, East Africa. Two of the passengers are “Mr. J. MUIR, 40, Farm Manager’ and Mrs. A. MUIR, 35”. The names, ages, date, occupation, and place of departure fit. Is this John and Agnes? The informant of Agnes’ death in 1945 was a niece with the surname GRAY. Hopefully more research will turn up information about the missing years in John and Agnes life, and whether or not they were in Kenya. And whether John is one of the people in the photo used in the banner of this blog. With this information we could help John and Agnes tell TheirOwnStories.